Paltry Topic for the Legal Eagle? No one can refute the lasting success of John Grisham as a storyteller. As the author of thirty one novels and sales in the many millions, he enjoys an ardent following of readers, besotted by the fast-moving plotlines, most often exposing some of the fascinating nooks and crannies of the US criminal justice system (though my personal favourite is unrelated to the law – “A Painted House”). Rarely retracing his steps, one must admire too, the author’s originality as well as professional longevity. As Grisham divulges in the ‘author’s note’, the kernel of this latest book grew from a magazine article by Paul Campos lamenting “The Law School Scam”. A system that apparently preys on the aspirations of wannabe student lawyers, lured by the prospect of a well-paid career, which will never be realised by the majority, yet burden the recipients with mountainous debts, is potentially scandalous and ripe for the Grisham spotlight. Cue four student friends approaching their final semester at the sub-prime ‘Foggy Bottom Law School’. Each is tending a debt of around $200K and has a ‘handler’ keen to establish a repayment plan. As realisation hits that job prospects are poor and only 50% are predicted to even pass the bar exam, the bleak future calls for radical measures. The friends identify that they have been scammed by the system and wealthy vested interests and embark on a naïve, but bold, scam of their own. There is something endearing about the youngsters blundering around in an environment, until recently, a hypothetical arena of law. Surrounded by the more hardened beasts of the jungle, however, they have the audacity of youth and an inventiveness born of necessity. For the reader, there is also something enjoyable about the clear underdog blowing a metaphorical raspberry in the face of the establishment. Perhaps it panders to romantic notions of Robin Hood-esque wealth redistribution, or the victim turning the tables on the ‘real’ criminals, but it is a compelling cocktail and one that the author exploits to the full. Grisham is a master of the suspenseful, thrilling story and the pace and weave of the unfolding strands is beguiling. I don’t think this book is as dramatic as a number of the author’s other novels. Nor are the relationships as convincing. The ending also reminded me of the movie, “Trading Places”. Yet, for all that, it was a compelling read that I've happily skipped through in ‘holiday-read’ fashion. It is hard not to have a sneaking regard for life’s rebels and though the central characters are hardly white-collar musketeers, their ‘all for one and one for all’ approach has the reader willing them to ‘beat’ the system. 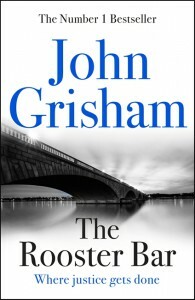 For Mr Grisham, another book and another bestseller no doubt, albeit not his best.